They have come into my life in a variety of ways – from shelters, rescue groups, breeder re-home, and after much soul searching, a ten-week-old puppy from a breeder. No matter how they arrived, I have vowed to give them a forever home where they are safe and loved. Loved deeply, I should add. Each one has been a gift and a blessing, touching my life in unexpected ways. 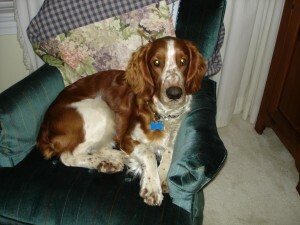 Baker was adopted in November, 2010 through Welsh Springer Spaniel Rescue. He was put up for adoption at age five, when his original family’s circumstances changed. In corresponding with his breeder and tracing his pedigree, I discovered that he is related to Byron, my first Welsh Springer, three generations back on both sides of his parentage. This amazing coincidence makes him even more special to me. After working hard on obedience, in July 2011 Baker became a registered therapy dog with the Delta Society. Alex was born in June, 2008 and joined my family in August, 2008. Although he comes from a long line of champions, I’m hoping he’ll be a therapy dog with Paws with a Purpose when he grows up. 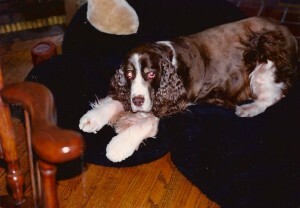 Emily was adopted from English Springer Rescue in December 1997. She was three years old, and I was her third home. She was with me through several moves and life changes. On my worst days, she gladdened my heart with her beautiful springer smile and roo-roo greeting. She was patient and kind to Alex, even when he thought her long ears were a tug-toy. 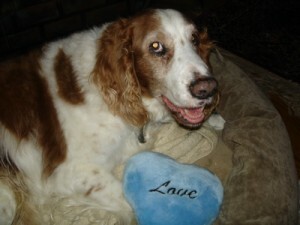 Emily crossed the Rainbow Bridge on February 13, 2009. Alex and I miss her. 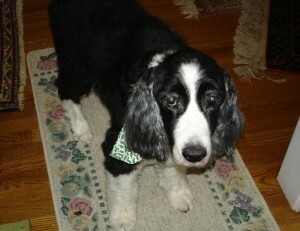 Dixie, an English Springer spaniel, was adopted in March, 1994 when she was eight years old. Her former family was dealing with terminal illness and had to find another home for her. Dixie was with me for three years, and taught me to stop and smell the roses. Byron was adopted from his breeder in May, 1994. 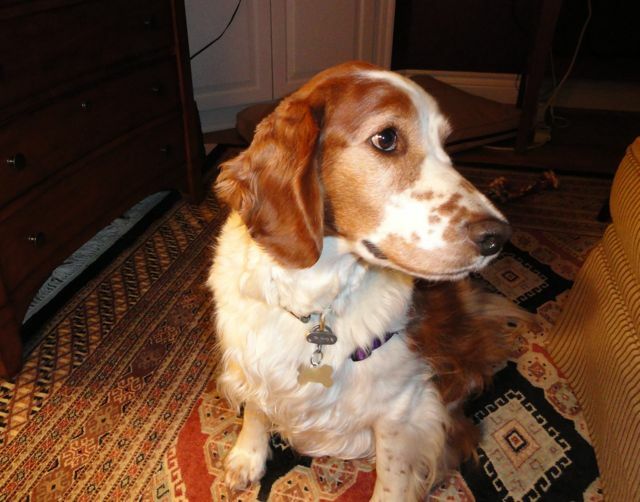 After learning that Welsh springer puppies are spoken for before they are born, I was thrilled to find a young adult available, a re-home situation. Byron was truly one of the heart dogs of my life. I said goodbye to him on November 7, 2007. 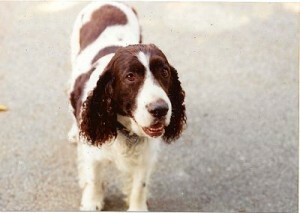 Chester was my first English Springer. I found him at the Santa Fe, NM animal shelter. As I walked past his cage he stuck his paws through the wire and flailed them at me. He was four years old and had been surrendered because his family was moving. 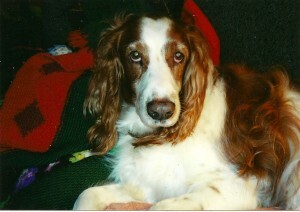 He was with me for ten years until he died of lymphoma in November, 1997 at age 14. A true Velcro dog, he followed me from room to room until his last day. I read passages from Angel Pawprints at his burial in Los Angeles Memorial Pet Park. He will always have a special place in my heart. 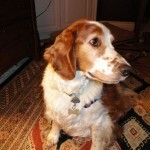 Molly was adopted from the Santa Fe, NM shelter just hours before she was scheduled to be put down. 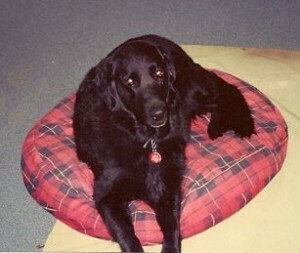 I think she was a flat-coat retriever. She was a gentle soul, always kind and loving. 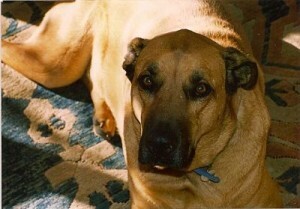 She was with me for seven years and died from complications of surgery to remove a tumor. She was one of the inspirations for Angel Pawprints. Marmaduke was adopted from the Santa Fe, NM shelter. Possibly a Mastiff mix, she was about two years old at the time. Although she was a challenge at times, her motto was always “count me in!” She was diagnosed with hemangiosarcoma, an aggressive and incurable cancer, at about age nine. Her courageous battle taught me legions about strength, love, and loss. She inspired Angel Pawprints as her legacy.